An efficient duct system is a must for a comfortable home. Any leakage from the ducts will affect the quality of indoor air. 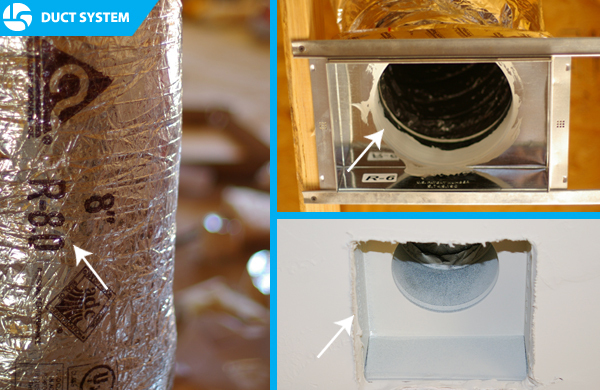 In a Home Creations home, tightly sealed ducts distribute conditioned air effectively throughout your home. Click here to learn about the energy efficiency of our homes. 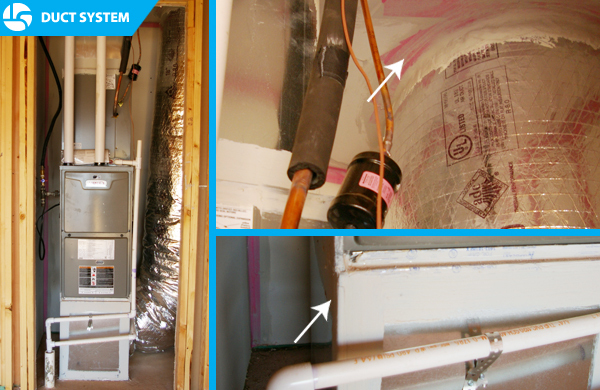 (LEFT) R8 insulated ducts are more resistant to heat loss or gain as conditioned air travels from the HVAC system through ducts in the attic into living space. (RIGHT) Seams in boot are sealed with mastic before sheetrock is installed, followed by caulking around the gap after sheetrock to prevent air leakage. We install HVAC Systems that are 96% efficient (ie. furnace) and 16 SEER (ie. air conditioner). All seams and ducts around the air handling unit are sealed with mastic to prevent air leakage from unit and maintain high efficiency. Sealing holes and cracks in the duct systems also reduce drafts, moisture, dust, pollen and noise.